On Bestwebframeworks are now two new frameworks: The new Ruby framework Pakyow and the self-explanatory Adventure PHP Framework. You could review and rate it on their overview sites: Pakyow - Review and Adventure PHP Framework - Review. Originally developed as technical base for the new version of the TYPO3 CMS, the FLOW3 framework developed into a own, independent project. It's one of the first PHP frameworks which is construed for DDD (Domain-driven Design), it also supports natively the object persistense library Doctrine 2 (which supports many databases) such as the object-oriented database CouchDB. To run FLOW3 you'll need at least PHP 5.3.2, access to the commando line and a Doctrine supported database. The development of Zend Framework 2 precedes and many alterations should brace the dominant position of this framework. The team plans to release no less than every six weeks a new release. In this first beta release the biggest change is the new MVC layer which is completely reworked; built on top of HTTP, EventManager and Di. Other refactored components are Sessions, Exceptions, EventManager-, Dependency-Injection and also the Zend-Cloud-Infrastructure. If you want to know more about the new MVC of ZF2, there's already a Quick Start online. The core team of CakePHP released today, the 17th of October, version 2 of their PHP framework. The main changes are the switch from minimum PHP4 requirement to PHP 5.2+, using main PHP features like SPL, JSON, Exceptions, PDO, PSR-0 file naming, a completely refactored authentication system and HTML5 form inputs support. A complete list with all changes could you find on the CakePHP bakery page. The CakePHP framework review page is also updated now and represents CakePHP in version 2. 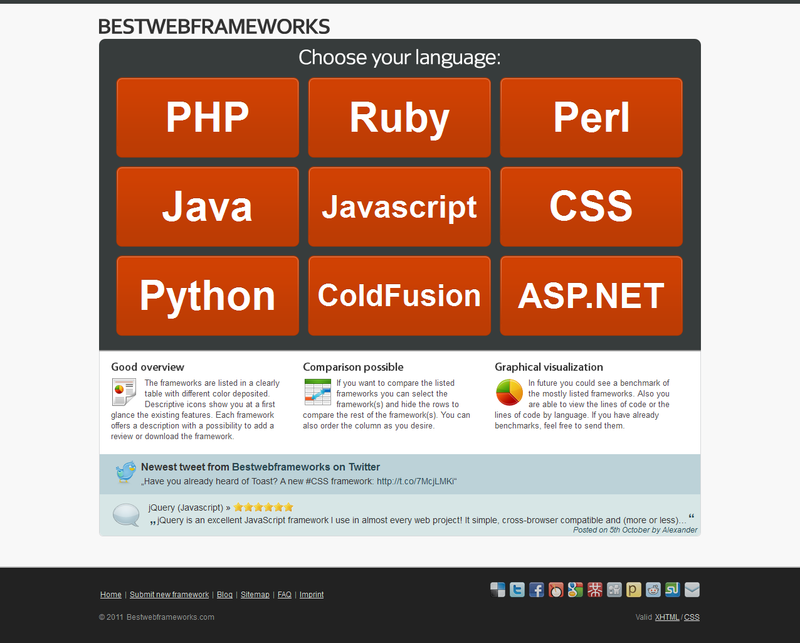 After many many work hours and some sleepless nights is version 3 of Bestwebframeworks (BWF) now finally online! The first thing you'll notice will be the new design which should be clearer and more accessible for comparison and the viewing experience.